Mater Admirabilis is the representation of the Virgin Mary surrounded by two angels. 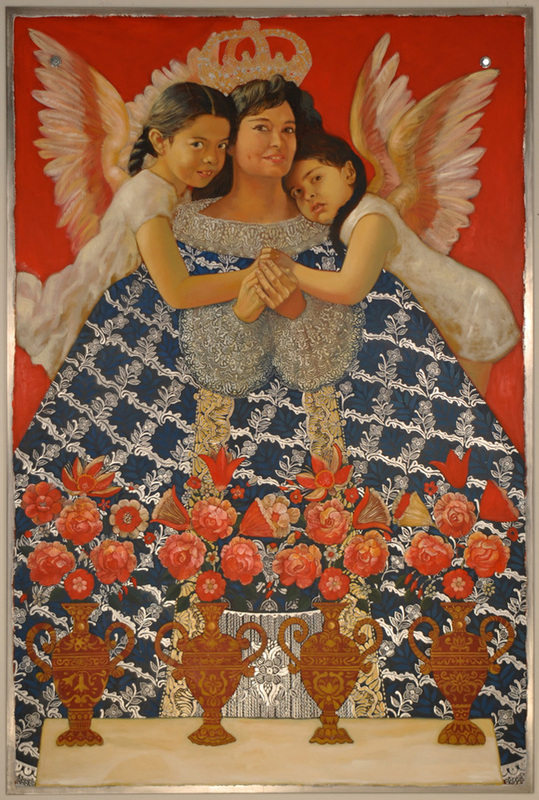 It is also a family portrait of Velarde’s mother (center), Velarde’s sister Vida (left), and Velarde herself (right). Mater Admirabilis was developed from an old photograph that Velarde’s mother had taken with her and her sister in Cusco at the Martin Chambi Photography Studio which is run by the daughter of an old classmate of Velarde’s mother. It is a nostalgic remembrance of Velarde’s mother who was then beautiful and busy, always present but always immersed in her work, in a life usually witnessed but rarely participated. In Peru, Catholics have a strong relationship with religious icons that often share their public and personal spaces. Velarde selected the iconography of the Virgin Mary to salute respectfully the concept of motherhood (love, protection) in the resemblance of her own mother.